Unless you're baking fat-free muffins, chances are excellent that your muffin tins are tarnished with baked-on grease. Baked-on grease can be difficult to remove, especially if you used a cooking spray as your grease of choice. As the problem started with baking, so does the solution. No harsh chemicals or backbreaking work are necessary to remove the grease. 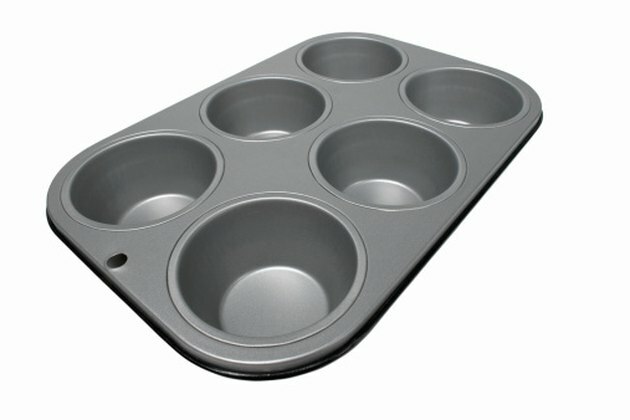 If you baked muffins or cupcakes in your muffin tin, you already have what you need in your kitchen. A muffin tin is beautiful when clean, but a nightmare when caked with baked-on grease. Mix 2 tablespoons of baking soda with 1 quart of warm water. Stir or shake until baking soda is completely dissolved. Pour baking soda mixture into muffin pan. Do not worry if grease is all over the pan and not just in the muffin cups themselves. Bake the muffin pan, filled with its baking soda solution, for 20 minutes. Remove from oven and let cool. Scrub the muffin pan in your sink using warm, soapy water and a dish sponge. Use a nylon bristle brush for any particularly stubborn grime. If necessary, apply a little undiluted dish soap directly to the affected area and allow it to sit undisturbed for five to 10 minutes -- then scrub again. Rinse the muffin pan thoroughly, dry it, and put it away.